Samsung has revealed to TechRadar that it has big plans for the OLED TV market and it will be releasing other, possible smaller versions of its 55-inch television in the future. 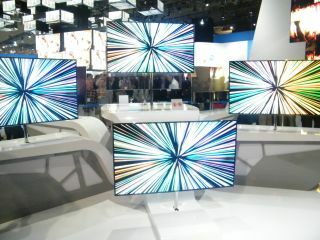 Speaking to TechRadar, Robert King, head of consumer electronics at Samsung, explained how important OLED was to the company and that it wanted to make a statement with its 55-inch television, which was announced at CES 2012. "55-inches was the largest size we could get on to one sized sheet, so we decided to focus on this size – OLED has been around for a little while, but getting out a big-screen was key for us," said King. When pressed on whether more OLED TVs coming, King commented that Samsung's focus was on its present television but "the range will grow - there will be design developments going forward and OLED will build in the years to come". This seems to confirm the news that Samsung is set to go on a massive OLED push, eventually superseding its LCD TV line-up with the technology. One of the problems with OLED is that because the panel is so thin, the audio quality can be compromised but King isn't too worried about sound problems. "We always try and get the best sound out of a TV but the physics behind this means that an external surround sound kit can improve on this. "We do strive to get the best sound we can in each category, however."